One of the best feelings I get is when I speak with someone who lets me know just how important The Center's work is. These conversations usually focus on a certain tool or resource that was particularly helpful or occurs at an event with industry experts that we host. I realize, when I have these conversations, that The Center and the projects that are built using our tools and resources, are examples of the power of collective impact. Our work and the resources we provide, depend on the commitment of our community which includes many people from different sectors, all working to support a common mission. This collaboration and support comes to us through many different types of relationships, including our partners, sponsors, members, educators and volunteers who work with our dedicated staff toward common goals, sharing case studies, participating in virtual and in-person educational events, and helping us to create and produce tools and resources that move our industry forward. I attribute much of our success to the momentum and energy created by this collective impact - ongoing conversations that help us anticipate emerging concerns and trends that, in turn, provide direction for us to research and create distinctive offerings, transforming promising concepts into needle-moving solutions vital to supporting innovation in healthcare design. Tool: "Community Health Center Facility Evaluation Tool"
Webinar: "The Future is Now - Integrating Technology into the New Memory Care Design"
Interview: "Design is a Social Art, Collaboration is Key - an interview with David Kamp, FASLA, LF, NA"
"There is seldom a day when we’re not seeing five, 10 or 20 people over 90 years old in here. It’s incredible,” said Evans, who as a longtime emergency physician has a front-row seat to a dramatic shift in America’s demographics. As the nation’s population ages, hospitals in California and across the country are bracing for ever-increasing numbers of elderly people landing in the emergency room. These patients often require more complex care than younger adults, yet emergency departments are typically ill-equipped to handle their special needs. In San Diego County, however, that’s starting to change. In fact, San Diego-area hospitals are at the forefront of what amounts to a grand experiment to overhaul geriatric emergency care on the West Coast. It’s an experiment because the trend of customizing ER treatment for older patients hasn’t existed long enough for a comprehensive assessment, and the studies conducted so far have yielded mixed results in terms of whether such efforts boost recovery times, lower hospital readmission rates and ultimately save taxpayers money. The San Diego Union Tribune, more . . .
A health center in Anchorage, Alaska, was ahead of its time. Since 1985, Southcentral Foundation, a center that serves native Alaskans, has woven mental health services into its primary care practice. The center has had impressive results and is now being held up as a model as the healthcare system looks at ways to better provide mental health services to patients. Bringing both mental and physical care under one roof is now being touted at as a way organizations can help patients and save money. Southcentral integrated that care after conducting a survey of its community and finding the top five health priorities were all related to mental health, including issues such as child sexual abuse, behavioral health counseling and addictions. FierceHealthcare, more . . .
* What impact do design decisions have on behavioral health outcomes? Join today's top experts on September 26, 2017 in Arlington, VA, at our next Pebble in Practice Workshop - "Behavioral Health—Strategic Facility Design Innovations that Improve Treatment Outcomes, Safety and the Bottom Line"
Healthcare facilities face special challenges in energy efficiency. Not only must they cope with the well know challenges of energy management, they must do so in a setting that is as mission-critical as it is possible to be. Indeed, it is not an exaggeration to say that an energy manager is a key player on a patient’s healthcare team. The first challenge is that they simply can’t go offline. It’s one thing to close down an assembly line or even lose stock in a refrigerator when it fails. It’s another thing to lose power in the emergency room. It can’t happen. The second element that puts pressure on hospitals is that energy is used for more things than perhaps any other type of facility: Like universities and lodges, hospitals provide energy for living quarters, offices and laundry and food services. On top of that, however, is all the medical equipment. Energy Manager Today, more. . . Improving patient nutrition can save hospitals a lot of money, according to a new study. Advocate Health Care launched two nutrition models at four of its Chicago hospitals in 2014, and since then has enrolled more than 1,200 patients in the programs and saved more than $4.8 million in costs, according to research published in the journal American Health & Drug Benefits. Most of the savings came from reduced readmissions and shorter patient stays, averaging about $3,800 per patient. Previous research has suggested that disease-driven malnutrition is a financial burden on the healthcare system, increasing treatment costs by as much as $15.5 billion per year. The per capita costs vary by state, ranging from $36 in Utah to $65 in the District of Columbia. Advocate studied the impacts of its nutrition programs on its readmission rates, and it found that readmissions decreased by 27% and cut stays by two days. Using that data as a baseline, researchers at healthcare company Abbott Laboratories estimated the cost impacts. FierceHealthcare, more . . .
Don’t miss this affordable, high-return day - a chance to learn from experts & re-charge your batteries. early bird rate and be entered to win Mardelle Shepley's new book and a one-year CHD webinar pass. 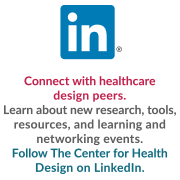 A complete, user-friendly library of healthcare design resources that continues to grow with the latest research - it's the place to start all of your searches for articles and research citations on healthcare design topics. Enjoy this free resource with over 599 key point summaries here. This award – a natural next step in the EBD progression – recognizes the use of an evidence-based design process in the pursuit of increasing value, improving outcomes, and engagement of stakeholders. Awards are given to projects that show exemplary achievement across touchstones of the EBD process: collaboration, evaluation, and sharing. Collaborate: Submissions must demonstrate interdisciplinary team and stakeholder education, engagement and development. Evaluate: Submissions must demonstrate the extent to which research was found, evaluated, and applied to link design to outcomes and measurement of results. Share: Submissions must demonstrate how the EBD process was applied and how the knowledge gained was disseminated, captured, and has the potential for application to future projects. Awards are determined based on how well the project meets criteria to achieve different levels of recognition. Applicants are not compared to one another; only against award criteria. Those who submit to the awards program by September 15, 2017 and are awarded an EBD Touchstone Award will be recognized at the Healthcare Design Expo & Conference on November 11, 2017.